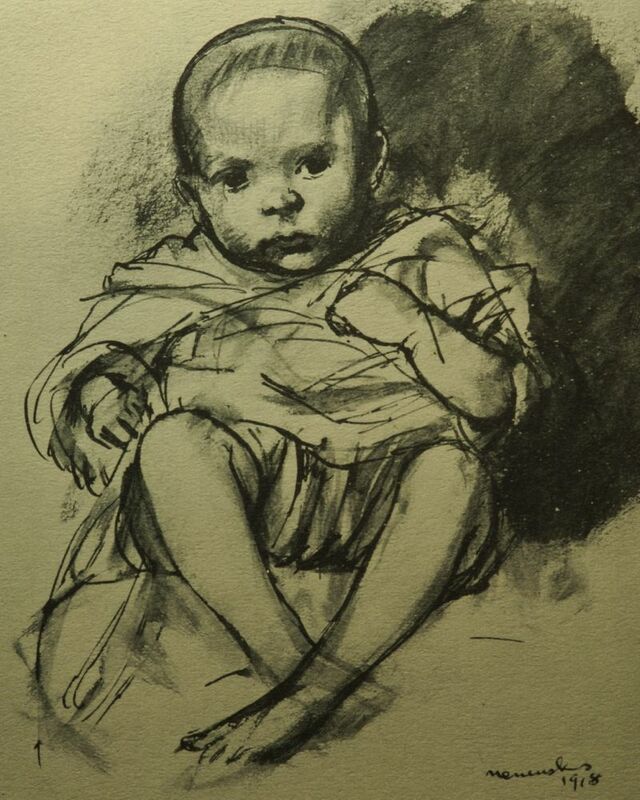 In the 16th April 1920 edition of the Athenaeum, I found the following short comments on "Mother and Child" with drawings by Bernard Meninsky and text by Jan Gordon. I have written on this book before. John Middleton Murry was editor of the Athenaeum at the time, in this its final phase (1919-1921). Mother and Child. Twenty-eight drawings by Bernard Meninsky, with text by Jan Gordon. Bernard Meninsky is a young artist who attracted attention last year by his exhibition at the Goupil Gallery, which included much promising work, notably a series of drawings of a mother with her infant child. Admirers of these drawings will welcome this book of reproductions, which conveys an adequate impression of Mr. Meninsky's achievements in this field. The studies vary in technical method and in merit; but it is evident that the artist responsible for the best of them is inspired with genuine enthusiasm and is a draughtsman of considerable attainments. It is impossible to avoid comparing them with the great heritage of Mother and Child representations which has come down to us in Christian art, and Mr. Gordon is possibly right in suggesting a root difference in approach between the devotional pictures of the Madonna and these intimate studies of infancy ; he is certainly right in pointing to Mr. Meninsky's preoccupation with real life as the basis of his art."